Penn Foster, a Bain Capital Double Impact company, has been dedicated to bridging the gap between education and economic opportunity for over 125 years. As the leading talent development platform for the middle skills education & training solutions marketplace, we partner with employers to design and deliver digital and blended learning programs that attract, upskill, and retain workers in America’s fastest-growing fields and professions. 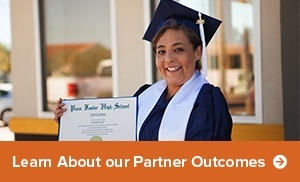 Through direct enrollment or via partnership with leading employers, community-based organizations and academic institutions, we help over 175,000 learners each year discover pathways to opportunity through skill training and accredited diploma, certificate and degree programs that matter in the world of work. We’re creating a national movement to upskill one million middle-skilled workers a year, and are actively building a coalition of purpose-minded leaders. The key to our mission of "democratizing education" and extending our reach to underserved populations is building a robust partnership strategy. Penn Foster partners with thousands of employers, schools, employment agencies, staffing firms, government, and non-profit organizations across the country to maximize our ability to reach learners. High School Completion: This regionally and nationally accredited high school completion program can be delivered in either a self-paced online or blended learning environment and is customized to meet the needs of career schools & colleges, employers, and youth organizations. Dropout Retrieval: Our flexible, convenient online high school courses provide a new pathway for at-risk students and are designed to help your students earn their high school diploma. Credit Recovery & Summer School: We offer over 100 self-paced, online high school courses to help your students earn the credits they need to stay on track for graduation or accelerate their studies. Career Readiness Bootcamp: This modular soft skills training solution is designed to help employees and job seekers develop the essential employability skills needed for long-term career success. Career Programs & Courses: Our portfolio of 100+ individual courses, certificates, career diplomas, associate degrees, and apprenticeships focused on middle skilled occupations help organizations deliver career-focused training to their learners and employees.